A brand new trio of heirloom recipes has just launched in FarmVille 2, but like so many others, this series will only be available for a very limited time. These items don't really have a theme, other than the fact that they're all connected to animals in a very slight way, but all three are available to create inside the same object: the Crafting Kiln. Don't worry about figuring out these recipes by yourself, as we're here with a complete guide to get you started! The first recipe of this trio is the Decorated Saddle, which can be created using five Fine Saddles and one Fired Glass. These Fine Saddles are earned by tending Prizes Horses, rather than Adult Horses, so keep that in mind. As for the Fired Glass, this is another crafting project in and of itself, and it can be created using one Porcelain and three Pieces of Glass. A single Porcelain is made out of four buckets of Mud. 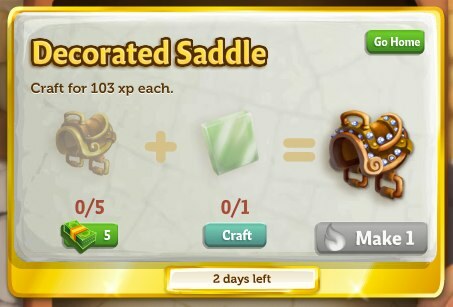 You'll receive 103 XP for each Decorated Saddle you create, and you can sell a single one for 500 coins. The second recipe is for a Commemorative Plate, which is made using eight Jars of Clay and one batch of Green Glaze. The Jars of Clay are earned by sending individual requests to your neighbors for help, while the Green Glaze can also be crafted inside the Crafting Kiln. A single bottle of Green Glaze can be made using one Blue Glaze and one Yellow Glaze. Each type of Glaze is another crafting project, requiring items like Mud, Blueberries, Potter Slips and Lemon to create. 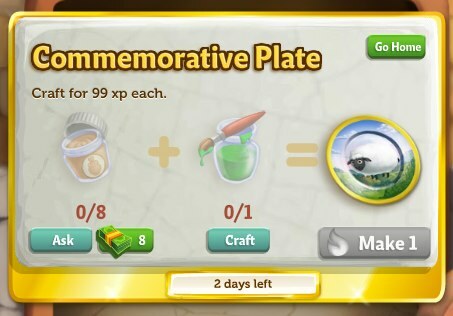 Once you complete this complicated process a single time, you'll receive 99 coins for creating that single Commemorative Plate. It can then be sold for 500 coins in the market. The final recipe in this set is the Piggy Necklace, which is actually only available to players that have reached at least Level 20 in their games. Once you hit that point, you'll be able to create this jewelry item using one Pink Glaze and five Terracotta. The Pink Glaze is made by combining Pink Pigment with a Pottery Slip, and the Pink Pigment can simply be earned by asking your friends to end it to you. As for the Terracotta, this is made using three Mud and four Wool per batch inside the Crafting Kiln. 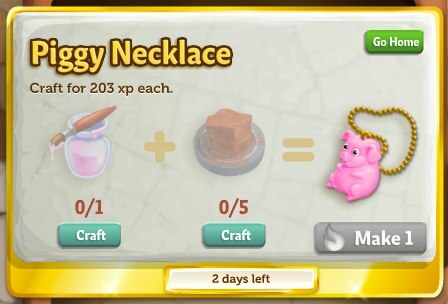 A single Piggy Necklace is only worth 500 coins, but you'll receive a whopping 203 XP for each one you create. These recipes will be available for less than three days on our farms, but remember, you can earn even more XP from them if you fill up the Crafting Kiln's XP meter before you start out. Good luck leveling up with the help of these recipes! 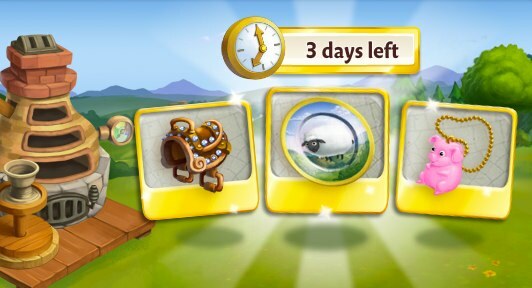 What do you think of these three new Heirloom Recipes in FarmVille 2? How many levels do you think you'll be able to earn by crafting these XP-intensive recipes? Sound off in the comments!